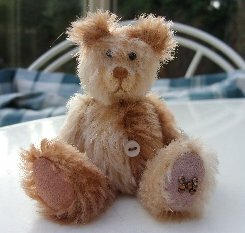 Let us introduce you to Irish Peach, a sweet 3 1/2" Harlequin bear named after an Apple Variety. He is made of two shades of the same type of German mohair with a synthetic silk mix which gives the fur a soft silky texture. The fur is pale peach (hence the name!) and light tan, his pads and paws are toning ultrasuede, he has a tan stitched nose and shiny black English glass eyes. Irish Peach is filled with steel shot to give him weight. He has a pale peach belly button and as you can see, he is charming little bear, I do hope that you like him. He costs £38 plus postage. Please note that as with all our bears, Irish Peach is not a toy and is not suitable for children. Sorry - Irish Peach has been adopted.